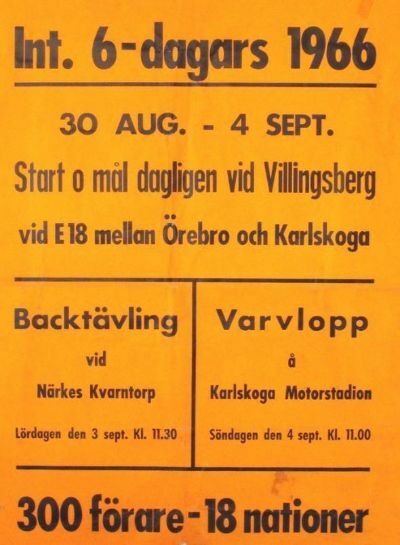 This year the 41st edition of the ISDT took place in Villingsberg, Sweden August 30th to Sept 4th. 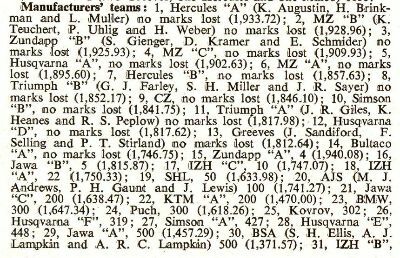 Arthur Williams is to blame for digging up data for this page!, ‘worth it though!, I shall gradually build the tale of the event in with anecdotes & info. 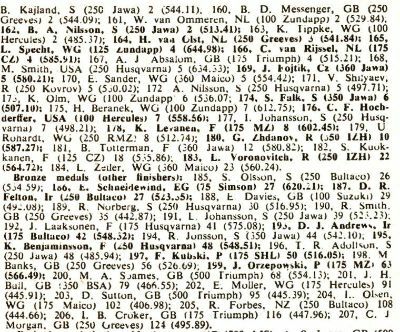 22 Teams of 4 in the Vase events from 13 countries, plus 36 x 3 rider manufacturer Teams. 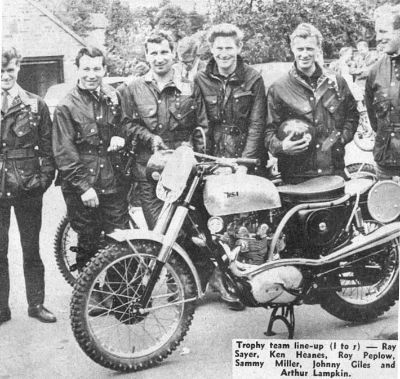 Brit Trophy Team had 5 on Triumphs & one on BSA. 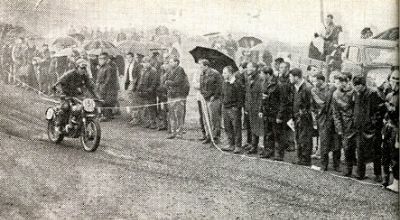 Veteran Frank Carey could not start his 125 Suzuki in the permitted hour & became a non Starter. 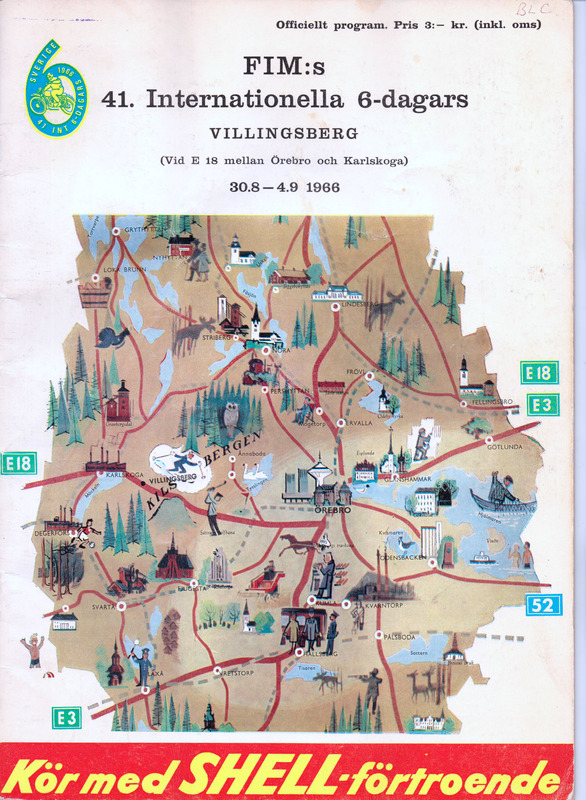 11 Special Tests awaited competitors 149 of 287 starters obtained Gold Medals, of 58 others, 34 took Silver, the rest Bronze.. Karlskaga to Orebro Artillery Training Ground was being largely used & 2nd day had 90 miles south of Villingsberg to cover. 22 retired on Day ONE!. East Germany took the Trophy & West Germany the Silver Vase. This Badge & above poster gently stored & unearthed by Brian Catt for us, many thanks Brian. Pat Slinn’s would love to get it back or at least find where it is, DVLA know where the number is registered from now, however cannot tell Pat, so please CAN ANYONE LET US KNOW??? Brian Catt came up with info which would escape a great many of us, at least it is now recorded here. 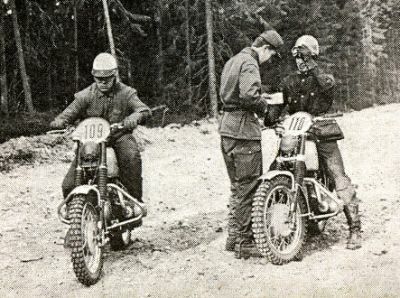 BSA & Triumph’s joint efforts were shown at a pre ISDT meeting Triumphs wore BSA Victor forks, Triumph frames & motors with low-level right side siamesed exhaust pipes. BSA? were BSA except for Triumph engines with High level left side siamesed exhaust pipes. 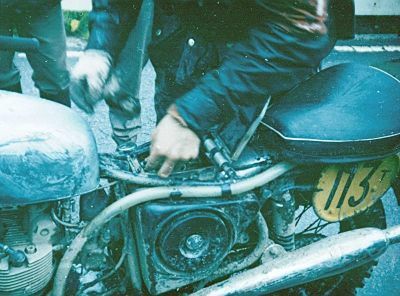 Triumph frames gave more ground clearance than BSA plus riders wanted greater access space to deal with the carburetor than high pipes allowed. 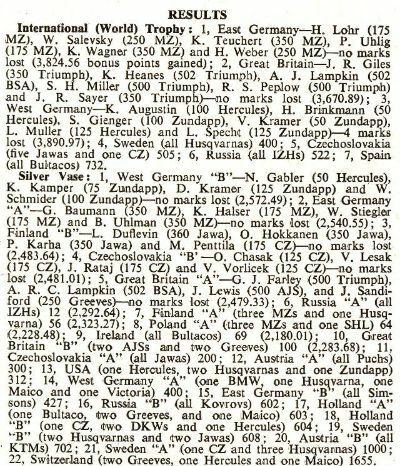 whew!, well spotted by Brian Catt & thanks for otherwise lost accuracy. 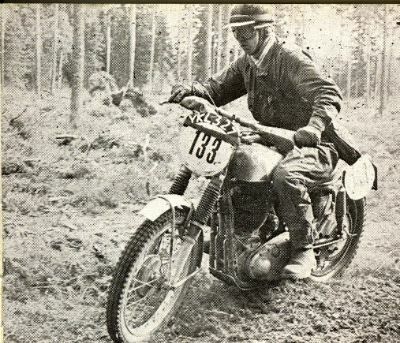 Arthur Lampkin is of course a member of an impressive off-road dynasty from Yorkshire. A beauty to own with that sort of registration number too!. 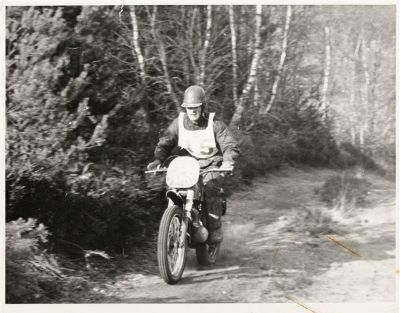 Photo of Pat Slinn here at the Team selection Trial at Bordon on that 175 Bantam Prototype ISDT machine. Photo with a better view in a far worse situation of that #133 P. Suckling machine which looks to have Norton Roadholder forks as well! 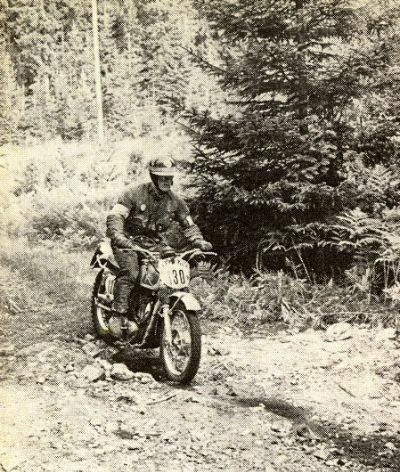 Photo from the collection of Brian Catt, a long-term ISDT enthusiast. 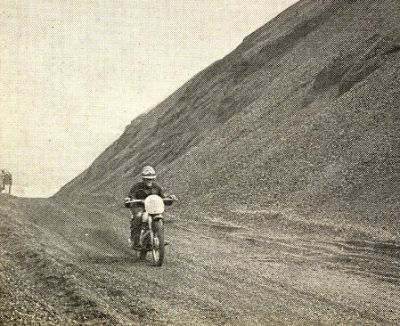 Photo of #246 P Chicheka 125 CZ goes onto Coutry section from Road at ISDT 1966. 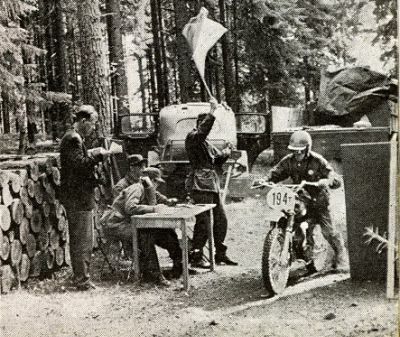 USA were one of the Teams which could not get their bikes there on time (non arrivals!!) 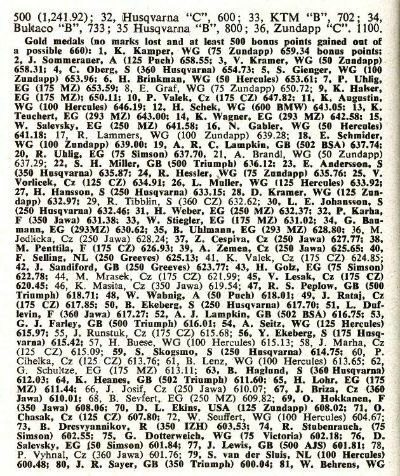 & he was provided with a 100 HERCULES, to get him to a Silver medal. – Check out ‘Where are they now?’ feature below for a recent photo of this bike. 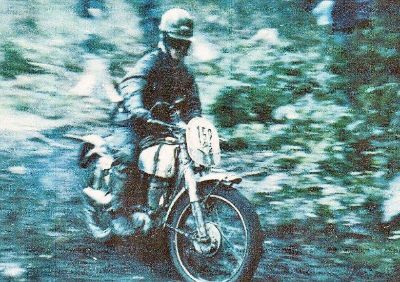 Photo of British Vase rider #30 Bill Wilkinson Greeves 250 in ISDT 1966. Day 3 had 92 miles of Rain. 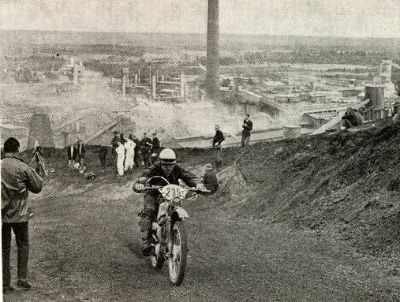 Photo of Jock Wilson Triumph at Kulma Slagtip where most spectators were noted to gather!, probably for spills!. 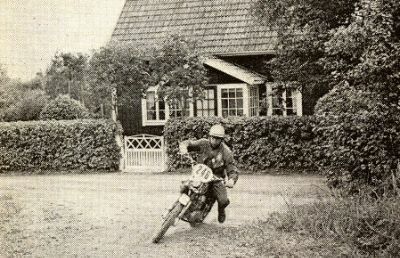 Jock later on the British Team Manager was the best British Privateer in ISDT 1966. 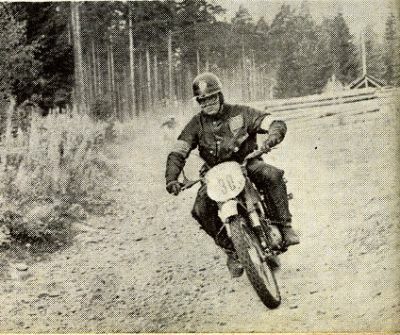 Thanks to Leo Keller we can identify Heino Büse of the WG Panzer Trappen Schule Team (Army School for Tank Forces Munsterlager), he rode with team-mate Burchard Lenz both on Hercules K 100 GS Factory machines along with Ruprecht Lamers on a Zündapp 100cc, they won the Club award, presented with their Cup by a Russian Admiral, ALL IN THE MIDDLE OF A COLD WAR only these plus Swedish Army & British Army Clubs were against 27 Civilian Clubs. 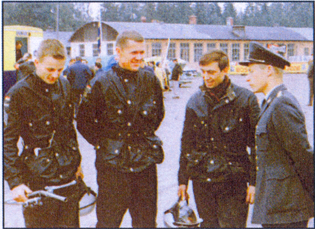 Swedish Army managed Special tests & Control points & check points. Day 4 had slower speed schedule after night rain. 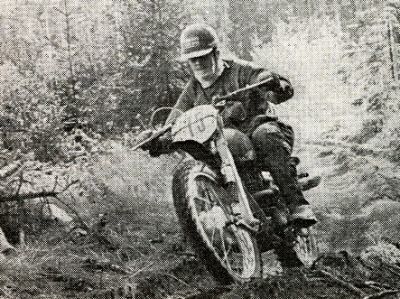 Sweden lead turned to a loss when Torsten Anderson’s Husqvarna packed in, he had repaired a leaking tank on the second day. Day 4 used the 1st day course in reverse direction. Day 5 had the 2nd day course in reverse direction 217 Starters. 6th Day had a 72 miles ride to a 3km winding but flat Karlskeger circuit. 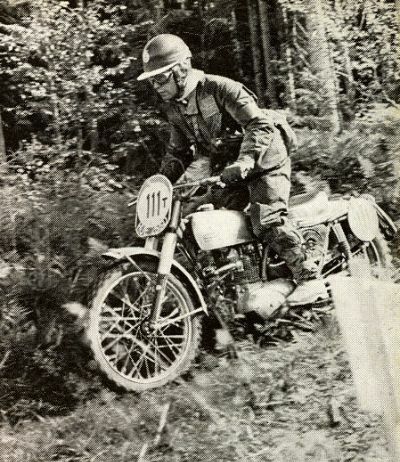 Tweesman on BMW went out plus lofty Tony Jones who hit a branch & broke the crankcase of his Matchless. Mick Andrews AJS Crankcase plug came out & all Gold hope was lost. 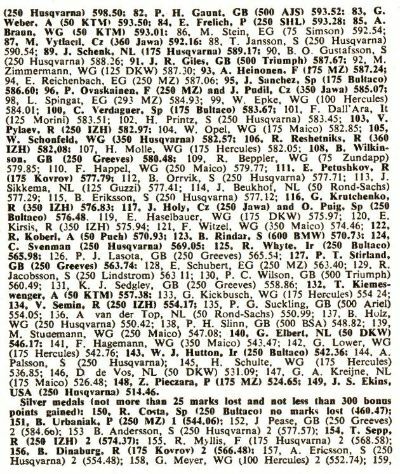 Brian Messenger on Greeves had troubles which saw him miss Gold by seconds, (Greeves always blamed plugs if anything went wrong!!) 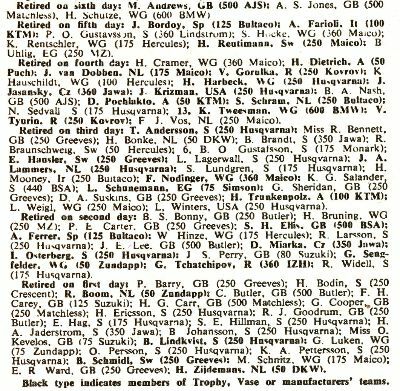 Sonny Absolom of Southend Club could only get 11 out of the 13 required laps in on his 175 Triumph & he lost Gold. 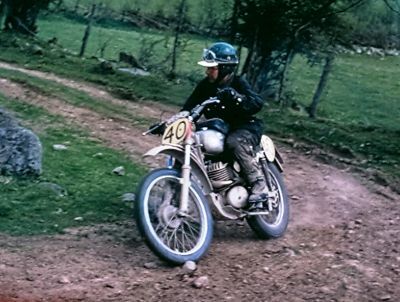 Here is a pic thanks to Brian Catt in 66 Showing one of the Overbored Twins used in the 750 Class, where he is working on the ignition layout, the OIL IN TANK type frame, you can see the filler cap to the left of his hand in the ignition recess, note the left side air filter, BSA QD wheels used for ease. For more details on this bike see the ‘where are they now’ feature at the end of this page. 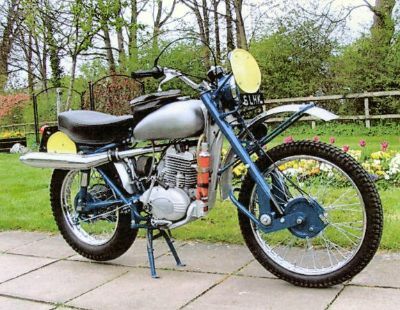 I am very grateful to STT reader Mark Reul who has sent me this photo of the 100cc Hercules of American rider Charles Hochderfer in it’s actual condition as found and purchased by an Italian collector. 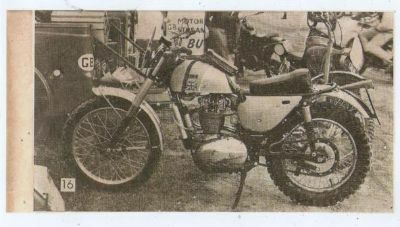 This bike was recovered and restored and features here in an interesting article, there is a article for subscribers to Classic Bikers Club that describes both the bike and the turmoil the British Bike industry was getting into during the mid 60’s which had an impact on the British performance and interest in the ISDT which had ceased to be a race of modified road going bikes into an event for specialist off road machinery which the British Manufacturers were not so keen to produce. The images featured in the article can be seen here. The pic of the Greeves in the shed at Bordon is my pic, but it needs to be placed a bit later in history….can’t remember exactly when, but probably 1968. Brian thank you very much for coming by to the new site, your help in setting the original site up was invaluable and I have made amendments to the Greeves image replacing it in the report on the 1968 ISDT. Please come back with more of your recollections and memories when you are able. My compliments for this very nice site!! I have a 1964 AJS Works ISDT. 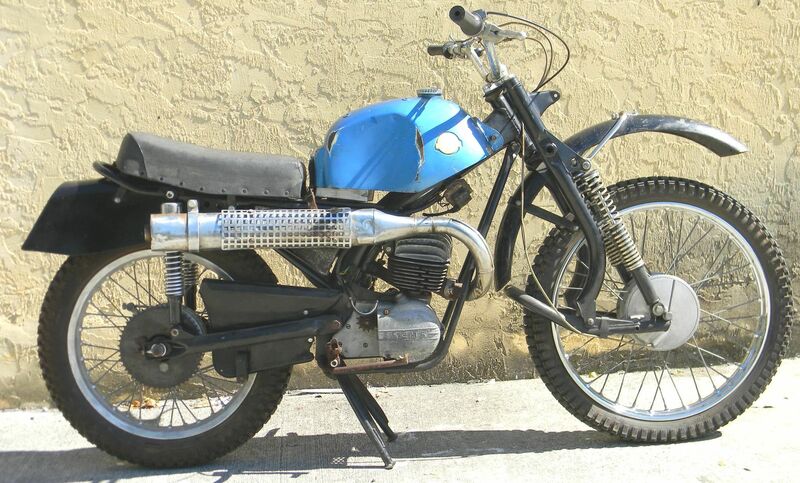 For this bike I’m looking for all sort of info, pictures or other documentation..
My AJS is restored about 25 years ago but they didn’t do it well..
That’s why I’m looking for all sorts of info about this type of AJS.. 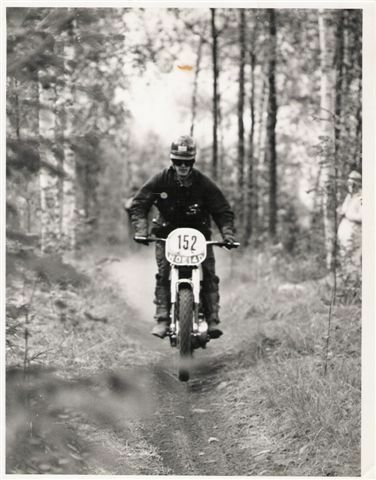 Thanks in advance for reading this and maybe we will find some info..
Hi Ronald, who rode your bike in the ISDT and in which year/years? I have no Idea who rode the bike. At this moment I know that the frame number is changed into a number with a licence plate. 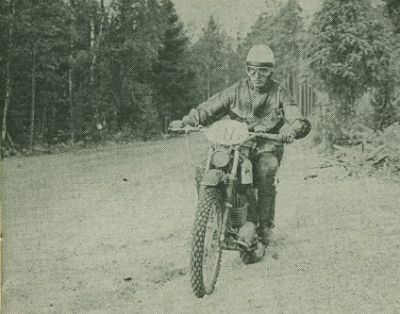 The engine number is Original and tell’s the bike is from 1964. I also know what parts are not correct. The exhaust (rickman), toolbox, seat and headlight are not correct and I’m missing the airbox. The Original 4″ Lucas headlight I found in june 2015 on Ebay. I ride the bike like it is now and I will restore the AJ in the future with the correct parts. My model is the same a the one Peter Gaunt rode with. All info about these bike are welcome also names of drivers etc are very welcome! I presume that the bike in question is one of the 3 (?) built and progressively modified for use in the Welsh and ISDTs. 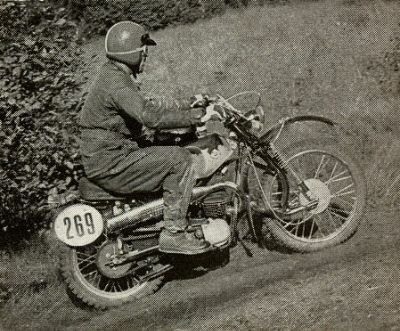 They were beautiful bikes, but were really too late as they were heavy and not competitive against the Triumphs. 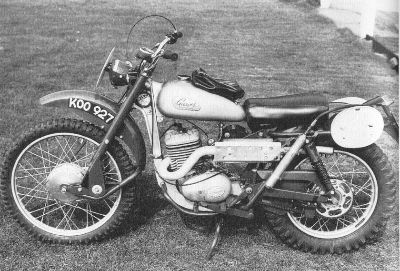 I only have one photo of one of these bikes, but they were well documented in the British Motorcycle magazines of the time. It is the same model like the 3. All info of these bikes are welcome! 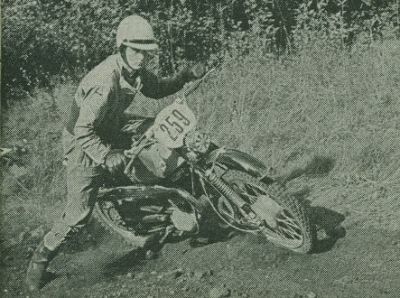 I have several photos from books and several of Mick Andrews bike that James Holland send me some years ago. I stil have some questions about these bike only no one can answer them at the moment.. So is there someone who knows howmuch bikes of this model are build? Are the all painted in the cromatic green or also in cromatic blue? Are the engine specs the same as the scrambler , G85 etc. or are they differend? Can you tell me in what magazines I can find the ISDT machines? 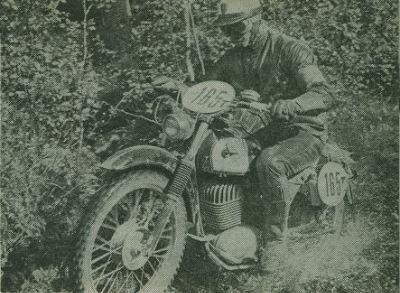 In terms of original reports you might want to contract the Morton’s Archive who acquired the copyright and entire archive of ‘the Motor Cycle’ which would have period articles on the ISDT events, teams & machines at that time they have a dedicated archives / sales set up which can provide good quality copies of the articles or photos if that is of interest to you. Ronald, I think one of the ISDT AJS machines is owned by Bill Faulkner, the former Oxford motorcycle dealer and ISDT competitor and BSA works rider. He has a large collection of motorcycles including a few ISDT machines. I was lucky enough to have a guided tour of his private museum last year when my local section of AJS & Matchless Owners Club organised a ride out to Bill’s house. Ralph do you have some photo of that bike? And are the engine specs known, are these the same as the scrambles or different? All info is very welcome. I have several photo’s of Mick Andrews bike. James Holland send them to me some years ago. 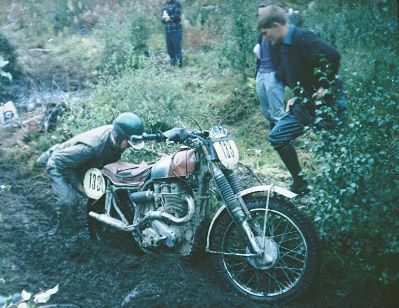 The bike was on a offroad bike show but unknown for me where and when..
Ronald, the best period photos that I have seen of the 3 bikes are in the large A4 format book called British Trials Motorcycles captioned by Ralph Venables and published by BMS. 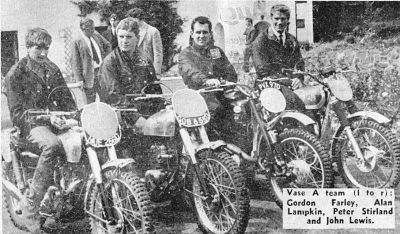 John Lewis and Peter Gaunt were Mick Andrews’ team mates on identical looking bikes. I recall seeing a magazine article a few years ago of one of the bikes which was a metallic green colour which I have since been told was correct colour! I personally prefer black or metallic blue for AJS comp tanks. Thanks, I will search for this book.. The bikes I saw were all Green and were outstanding in that colour. This green is that the same as the green of the later Norton hybrides? Ronald, steel flywheels and big inlet valve. Almost certainly G80CS spec. 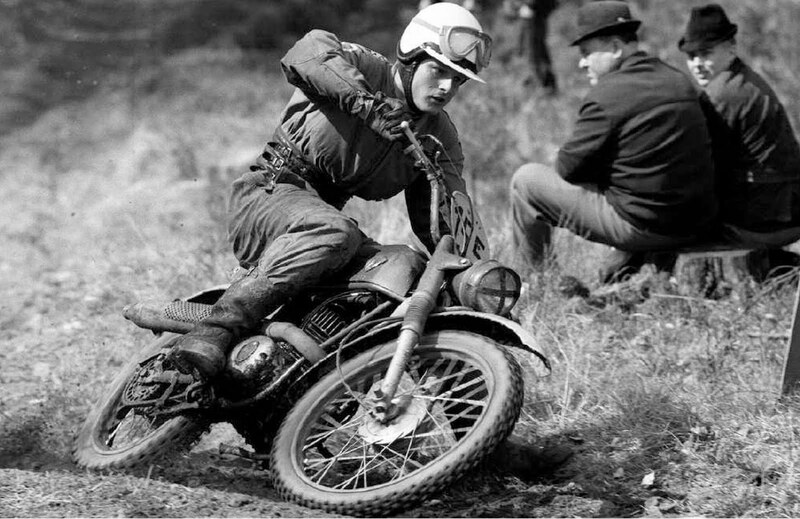 Take a look at http://www.mortonsarchive.com/v/stock/51329850/5793845002/ajs-matchless-scrapbook-mortons. Kind regards. My engine haves steel flyeheels, 35mm inlet with big valve like a CS. Only the cams are differend and not marked..their not std., not HS or CI.. carb. Is a 32mm concentric at the moment but must be a 30mm 389 monoblock. Ignition is condensor coil ignition like original on the isdt. This condensor replace the heavy battery (runs without battery ) and works perfect! thanks for the link. I found that photo with Peter Gaunt some times ago on the net. Not sure of it was the same site. BGC979B has capacitor ignition as they all did in 1966 no battery, the capacitor fits in the tool box which is modified to fit the chain oiler behind. Know the cams are specials my father carried a rubbing of it for years looking for a spare! No idea, but if you can send me an e-mail address, I will send my photo. My friend has acquired a Triumph 5TA reg EHW 437C,Engine No H42297w,Frame No 5TA H42297. 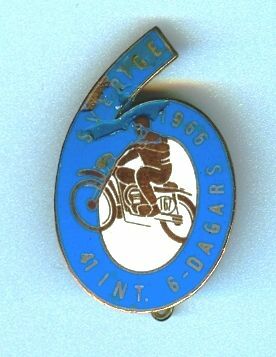 The previous owner claimed that it had been ridden in the 1966 ISDT in Sweden. 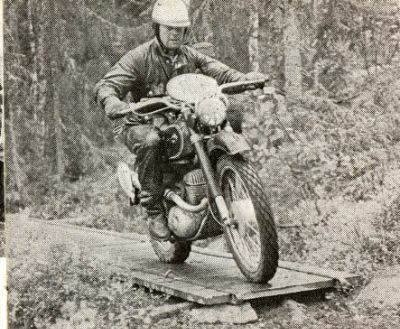 Can anyone confirm this and if so who rode it? We know it was a police model supplied by Fowlers of Bristol in November 1965. Brian Catt may know this? Mine is restored in 1994 back in England but I do not know who it did..